The Storm recovered from Diana Taurasi's late three-pointer in regulation to win in overtime. Seattle now leads the Mercury 2-0 in a best-of-five series, and can punch a ticket to the WNBA Finals if it wins on Friday in Phoenix. 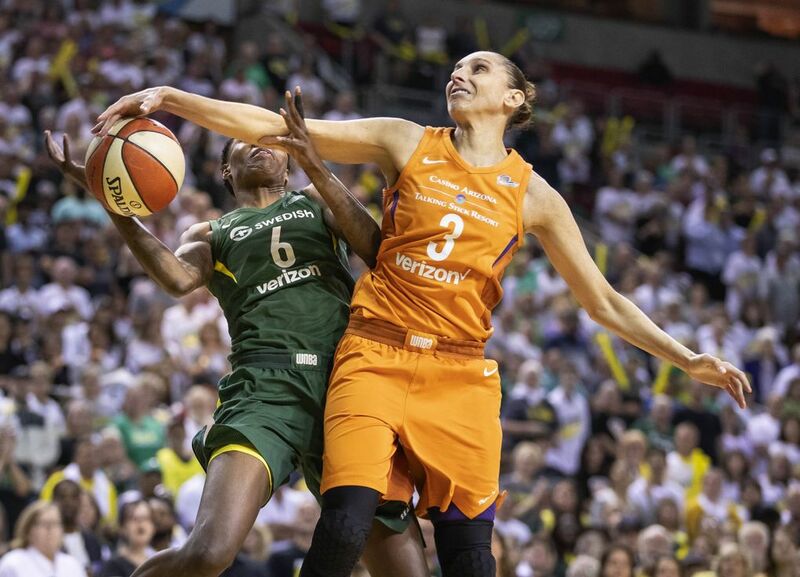 Sue Bird recognized that look of determination on Diana Taurasi’s face, but the top-seeded Storm were helpless to stop No. 5 Phoenix and its veteran star who took over in the fourth quarter. 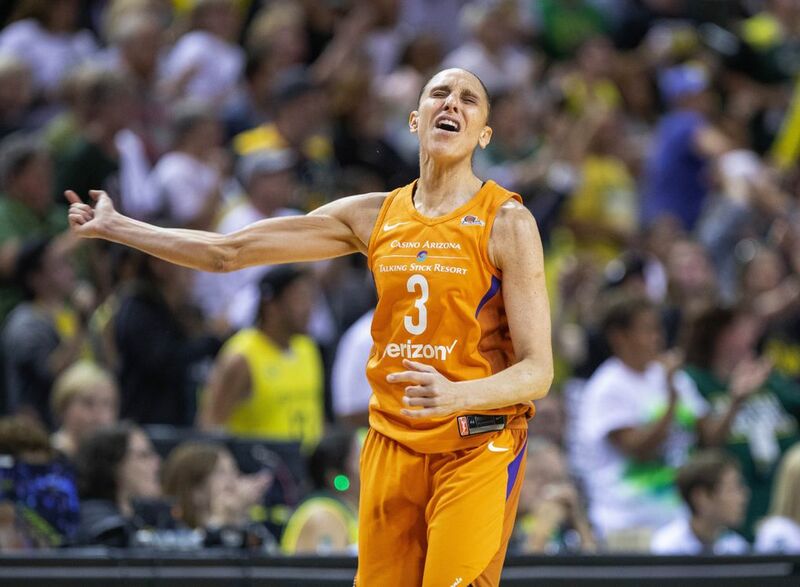 Taurasi outscored Seattle 14-12 in the period and drained an improbable three-pointer with 3.6 seconds left to cap a Mercury comeback from 19 points down and force overtime Tuesday in Game 2 of the WNBA semifinals. 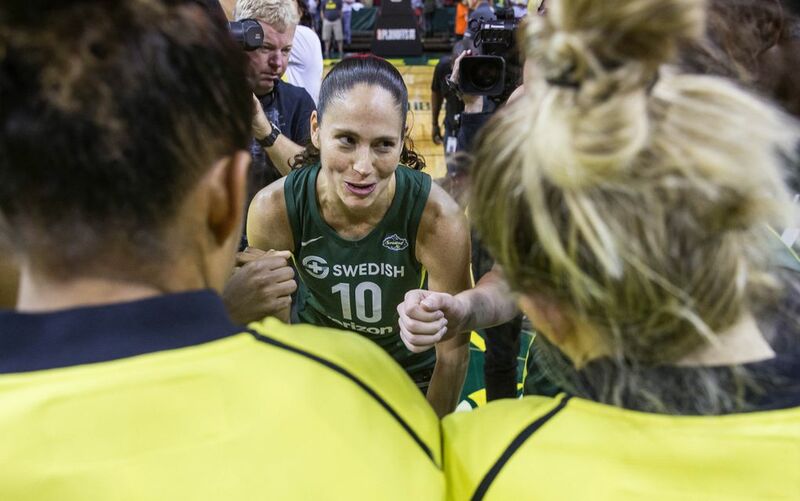 “I’ve seen her do it many times as her teammate, particularly in Russia,” said Bird, who teamed with Taurasi for two years at the University of Connecticut and eight years overseas. “I’ve seen her just single-handedly do exactly what she did in the fourth quarter. 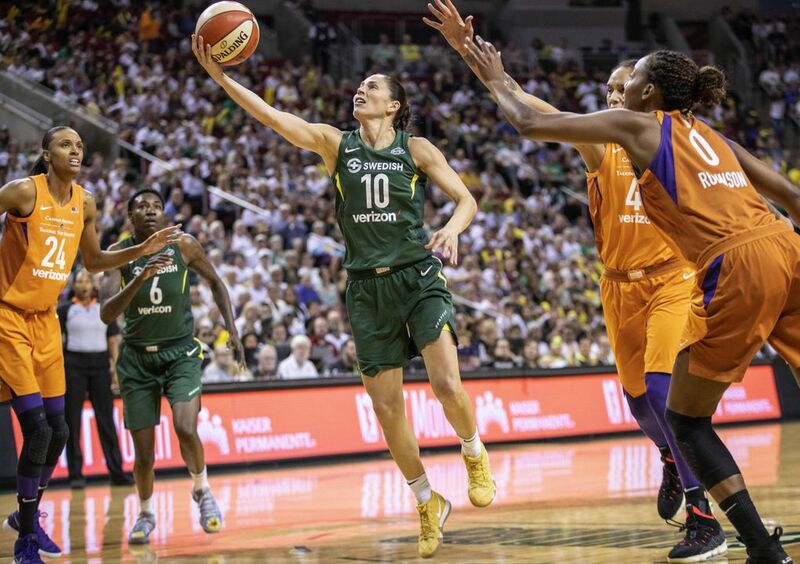 After Taurasi’s heroics, Bird had the final say and wove through traffic for a go-ahead layup with 1 minute, 9 seconds left in the extra period that gave Seattle a hard-fought 91-87 overtime victory in front of a sold-out crowd of 9,686 at KeyArena. “We were disappointed to have been in that situation,” said Bird, who finished with 19 points and six assists. “Emotions can run high. You can be upset and whatnot, but we all just took a moment. The score and result were identical to Game 1, but the ending was dramatically different. Once again the Storm built a double-digit lead in the fourth and for the second straight game Phoenix surged late with a furious rally. 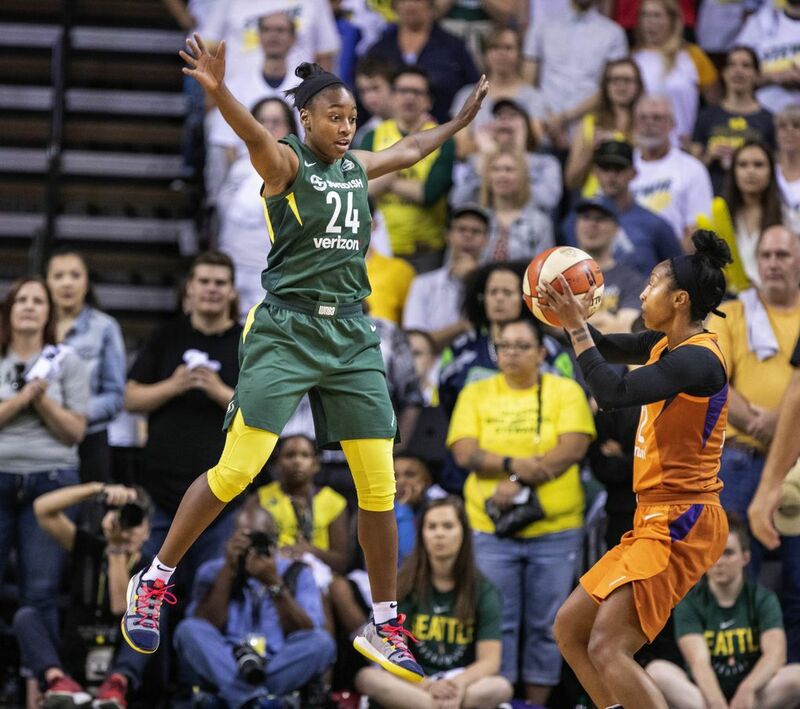 In its previous outing, Seattle led by 16 points in the third and saw its lead cut to two in the final 1:40 before holding on for a 91-87 victory on Sunday. 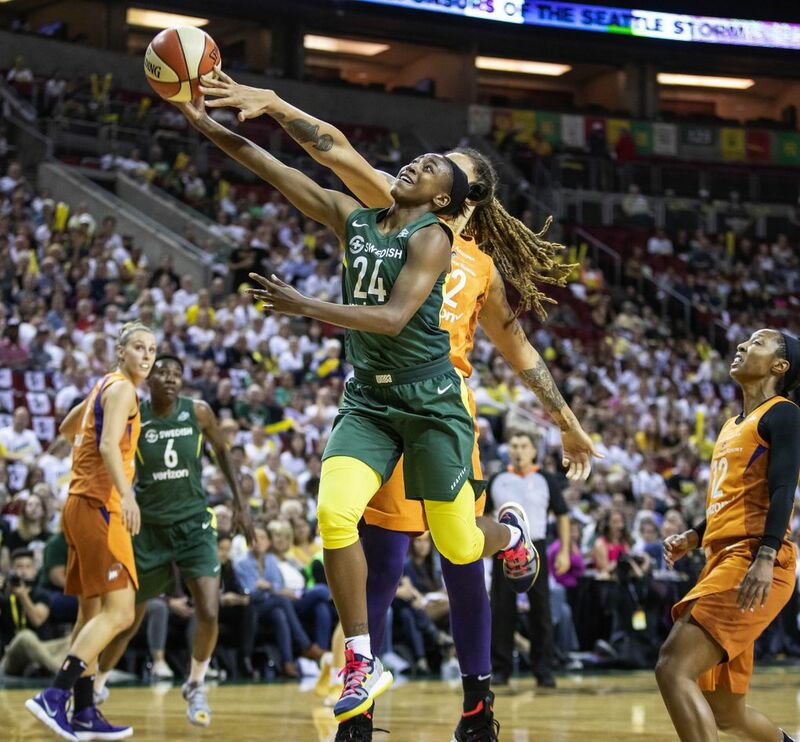 This time, the Storm was up 19 points (60-41) in the third quarter and 17 points in the fourth (71-54) before Phoenix rallied and outscored Seattle 25-8 to tie the score. After Taurasi launched a three-pointer over Bird and Alysha Clark to tie the score 79-79, the Storm called timeout and had 3.6 seconds for a rebuttal. 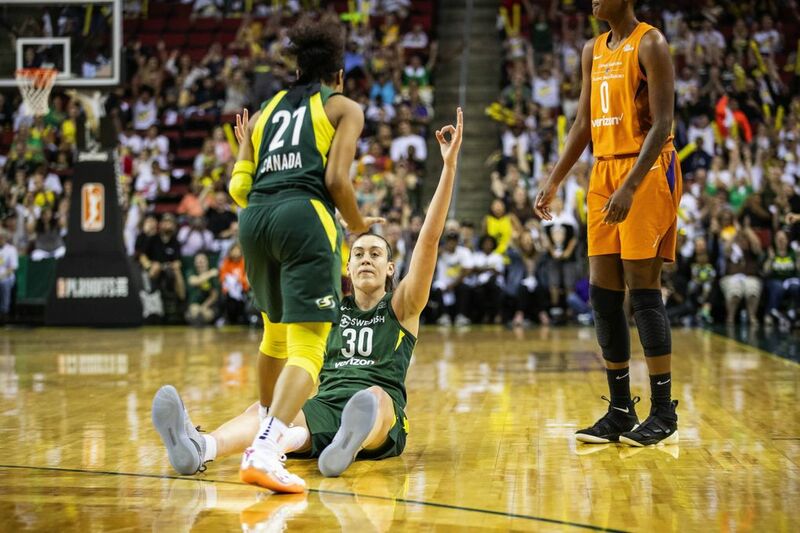 But league MVP Breanna Stewart, who scored just two of her team-high 27 points in the fourth, missed a mid-range jumper and Jewell Loyd’s putback didn’t go down as time expired in regulation. “You get the lead, you probably relax a little bit, and then all of a sudden, they start to get it going,” coach Dan Hughes said. “You could see it. This shot goes in. This shot goes in, then this shot goes in, so they get momentum and all of a sudden, the momentum has changed. If this playoff series has taught the Storm anything, it’s Phoenix won’t go down without a fight. The Mercury missed its first 14 three-pointers before connecting on the final five and finishing 5 of 19 from behind the arc. 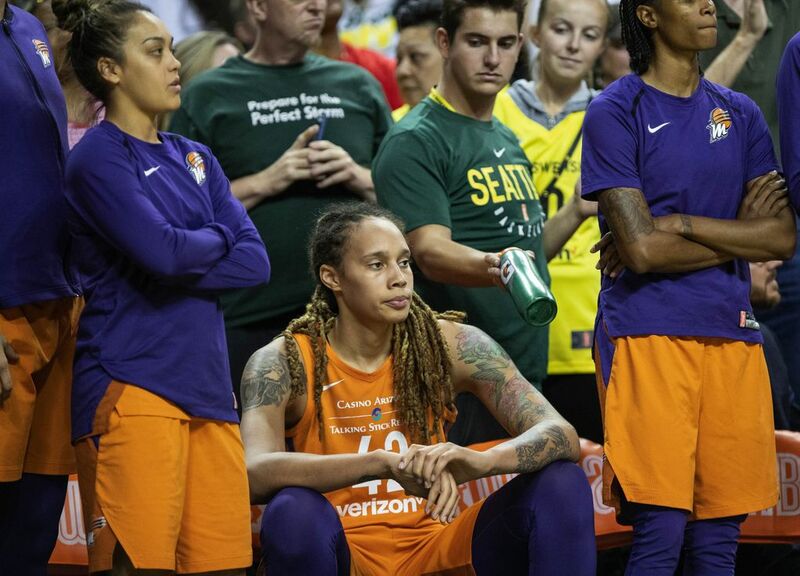 Phoenix center Brittney Griner rebounded from a flat 13-point outing in Game 1 and was unstoppable at times in the post. 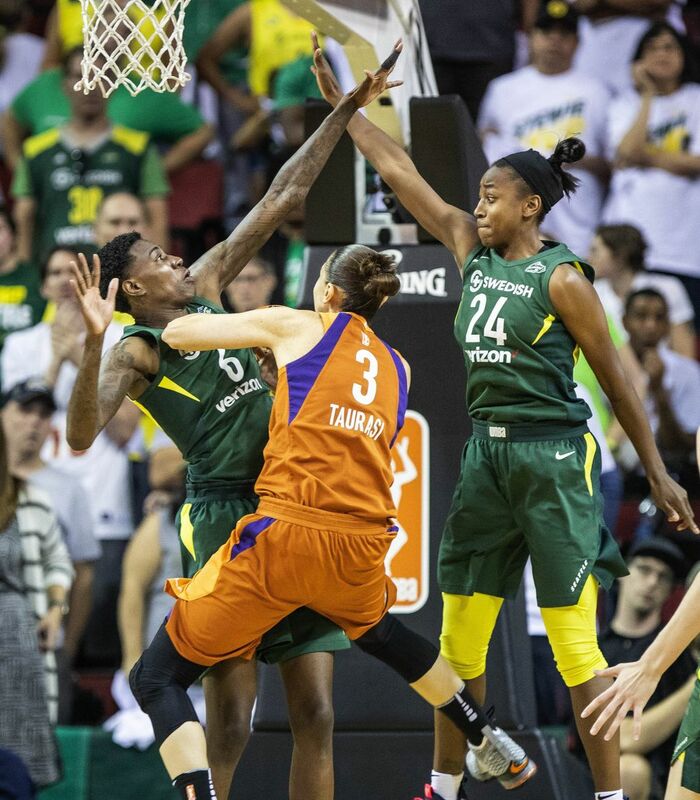 The five-time WNBA All-Star scored 23 points on 11-of-19 shooting and collected 10 rebounds in nearly 35 minutes before fouling out with 4:01 left in overtime. The Mercury also received another sensational performance (21 points) from forward DeWanner Bonner, but aside from its Big Three the other seven Phoenix players combined for just 15 points. Taurasi, who scored a game-high 28 points and sank 4 of 9 three-pointers, made a shot from downtown to put Phoenix ahead 85-81 with 3:21 remaining. Loyd countered with four unanswered points to tie it before Bonner put Phoenix on top again 87-85. From there, Loyd and Bird closed out the scoring. 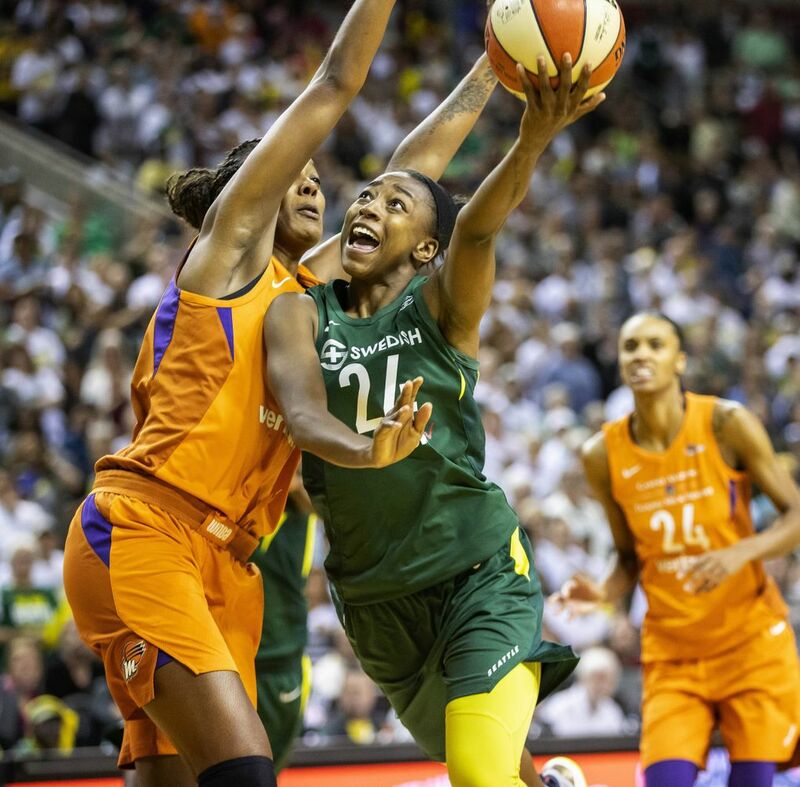 After Loyd hit a free throw to cut Seattle’s deficit to 87-86, Bird dribbled around Briann January for an uncontested layup that gave the Storm the lead for good. Loyd sank 1 of 2 at the line before Bird put Phoenix away with a pair of free throws and 2.1 seconds remaining. 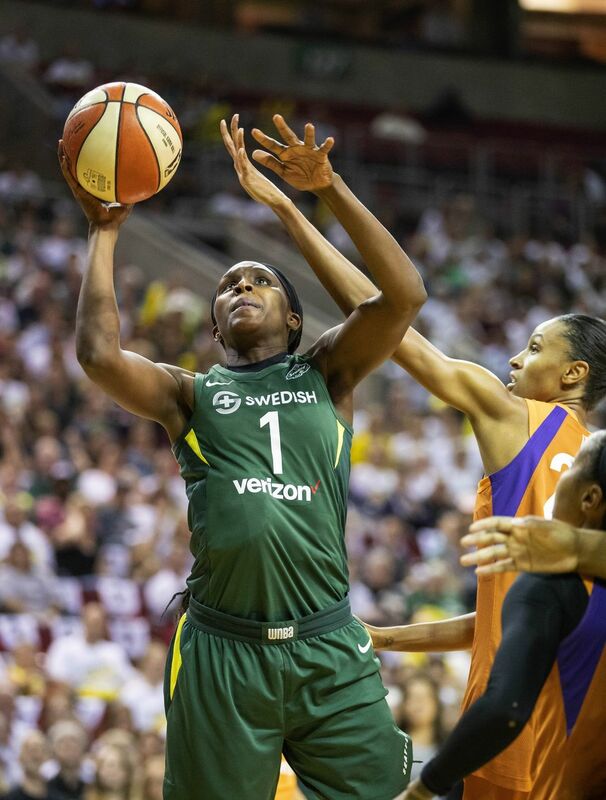 Before the game Hughes had hoped to squeeze a little more production from Seattle’s bench following a four-point display in Game 1 and rookie point guard Jordin Canada responded with 12 points on 5-for-5 shooting. The unexpected scoring boost offset a sluggish offensive outing from Loyd (13 points on 2-for-9 shooting) and Natasha Howard (10 points). 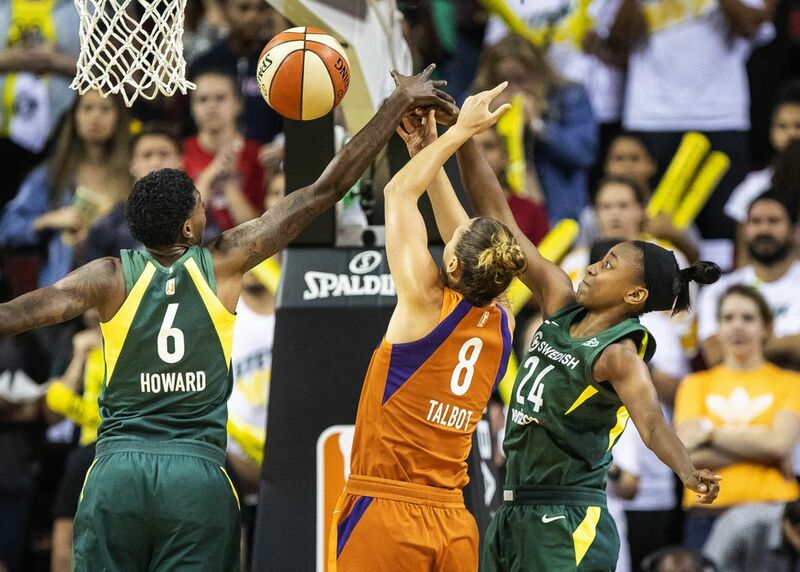 Inexplicably, the Storm has won two playoff games despite fourth-quarter meltdowns and the playoff math is now simple: win one more game in the best-of-five series to return to WNBA Finals appearance for the first time since 2010. Game 3 is at 7 p.m. Friday at Talking Stick Resort Arena in Phoenix. “It’s the playoffs and if you’re going to win a championship, you got to go through the best and Diana is the best,” Bird said. “For us to be able to weather these two games – of course we’re upset we lost the lead – but we weathered and we were able to still get the win against a great player and a really solid team.